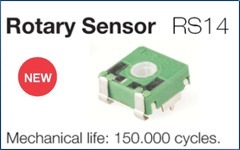 The RS14 rotary sensor has 150.000cycles of mechanical life, linearity of ± 3% and 10K ohm value ± 30% tolerance in its standard configuration. Maximum power dissipation is 0,15W at 40ºC. ACP’s RS14 is available in several through-hole and SMD configurations. ACP can study customizations of the standard configuration: special tapers with constant value areas, different slopes and ohm values, lower tolerances, linearity below 3%, etc. The link below is the RS14 catalogue in pdf. APPLICATIONS: The RS14 works by relating changes in angle position to changes in the output voltage. Therefore, ACP’s RS14 primarily works as position sensor and control. Its most usual applications are in the automotive, home appliance or industrial fields, mainly in situations where precision in position detection, reliability or mechanical life are critical. The sturdiness of this sensor makes it especially suitable for demanding applications. ACP’s sensor is lead-free, according to RoHS requirements. It also withstands the soldering conditions required for lead-free components. The main advantage you will find in dealing with ACP is our flexibility: Let us know your requests and we will study a customized solution. ACP is ISO 9001 certified with ISO/TS 16949 certification in process: assessment planned for January 2005.